Run the Train. Bike the Boat. Swim the Plane. They Ran against the 1929 No.7 Steam Train to McLean’s Mill National Historic Site, biked to Bamfield BC against the Frances Barkley boat to Bamfield and swam in Sproat Lake: home of the 1945 Martin Mars Water Bomber. Runners started at the Harbour Quay in downtown Port Alberni BC. They ran 500m or 10k, or 22k, or a whopping 42km full marathon. They raced against the train to McLean Mill, where I was set up at the finish line to capture the runners as they came in! Please contact me if you'd to own any of the images. Cyclists had an option of the Sprint ride to China Creek Marina for a 16km ride. Or Brave the notorious Bamfield Road and peddle for 90km to the small coastal village of Bamfield BC. Athletes were greeted with a BBQ lunch graciously hosted by the Huu-ay-aht First Nations. Fresh Salmon and burgers! 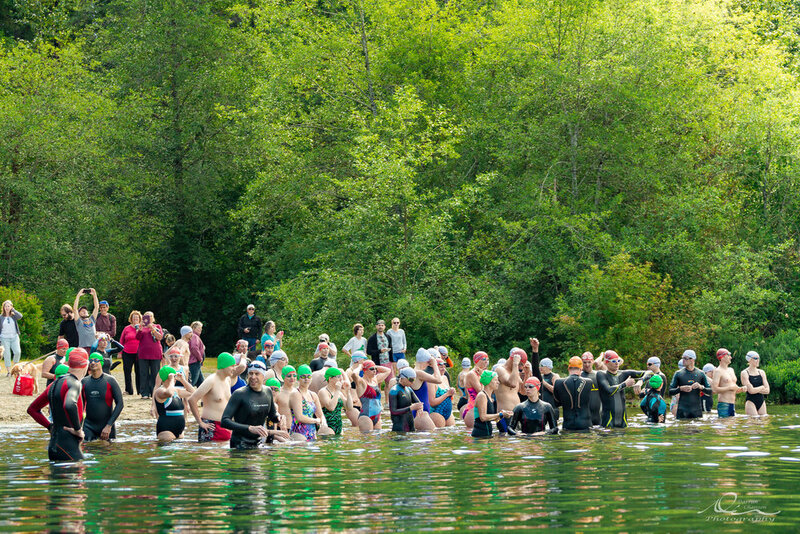 Athletes of all ages were welcome to come for a swim at Sproat Lake, home of the Mars Martin Water Bomber! Smolts (kids), a 500m, a 2k, and an arm numbing 4k option were available to any who dared! Awards, great food, and drinks were available for a post celebration at the beautiful Sproat Lake Landing and Drinkwaters. Spectacular place to unwind after a long weekend of greuling activity. Darran in the water during the TriConic Swim race risking everything to get the right shot. all images are ©Darran Chaisson Photography, and may not be used without permission.